We’ve all been there. We have an amazing product, customers tell us how beautiful/wonderful/interesting it is, there are loads of interest at conventions, but you go home and hear nothing. There are things you can do to make your business and products more likely to be featured, either here on Craft Hackers or anywhere else on the web. Today’s post is going to explore three things that you can do that will significantly increase your likelihood of both getting noticed and featured around the web. Obviously this is important for those who are looking to sell anything, but it can be the difference between getting featured and not. If you’re at a convention, make sure you engage with everyone browsing your stall, even if it is just by smiling at them. When people notice you interacting with them, even to such a small degree, they are more likely to talk to you about your wares. That is where you sell yourself and your work, to both customers and reviewers. 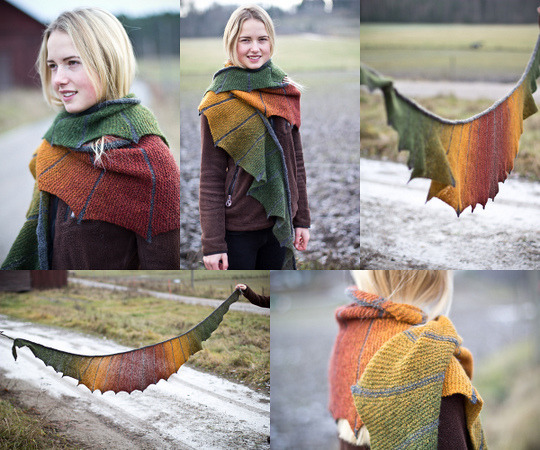 I’ve featured work that I might have passed by, just because of the wonderful discussions I had with the makers. Likewise, I’ve not featured work that I loved because the people selling it couldn’t be bothered to look up from their phone. I will say that when I go through cons looking at businesses, I rarely identify myself as a blogger/reviewer until the end of a conversation. So it is important to treat everyone as if they might be someone who could be a reviewer. It has the added benefit of making your product more attractive to customers, but do not underestimate the impact of the personal touch. We talked this spring about simple ways to make your photography better, and this is one of the easiest ways to up your chances of getting featured, as well as getting your product sold. Sites that look to feature artists and businesses want their site to look good as well as to keep their readers happy, and having better quality photos will be more attractive. This is important as the world is increasingly image-centric. What draws our eyes to different websites is not usually the text, but the photos and pictures. Once you have that immediate attention, then you can keep viewers there with good writing. But at the outset, if you want to get noticed, make sure your visuals are up to scratch. How do you go about this? Well, you could hire a professional, but these days most people have cameras that will do just fine in their pocket attached to their phone. Spend some time to learn about composition, lighting, make your own photo booth, how to do simple edits in Photoshop (or an equivalent program) and you’ll find that the response to your images will jump. This is especially important for reviewers as typically we will look at your stall/shop and enjoy it while we are there and go away to write. When we write, we rely on what you’ve provided online to remind us why you caught our eye in the first place, and if you have poor quality photos, I begin to doubt that the products I saw were really of the quality I thought they were, or that you are committed to your work as much as I’d like to see, or even that you’ve given me the right details. Visuals are key, and the more you can do to upgrade them, the more likely you are to catch someone’s eye. This leads us nicely to our next point. Notice that I did not say social media, but just online. I can’t tell you how many times I’ve walked away from a stand at a con, fully expecting to feature them and all their adorable little trinkets or one of a kind wonders, to find out that they are basically non-existent as far as the Internet is concerned. Maybe there’s an Etsy address on their business card, but there’s nothing for sale in it. Maybe they list a number of social medias, but nothing has been posted to any of them. Maybe they have one or two images up of their products, but it is low quality and unappealing. Your online presence is key for reviewers and those looking for a feature. There is this amazing mapmaker that I saw all summer at conventions who draws maps from mythical, fantasy, and sci fi realms that are stunning, but all they have online is a Tumblr with some poor quality photos. Even though I badly want to feature them, I can’t justify showing our readership such a poorly constructed online presence. There is nowhere to buy these maps online, and even the photos that exist don’t do the maps justice. If readers cannot be shown the products in a way that allows them to purchase, then most reviewers will walk on by. Again, I cannot stress enough that this is not about social media. This is about the basics. A website. An Etsy store. A point of call where you have contact details, product details, and hopefully a small bit about who you are as a business. You don’t need to be regularly posting on social media, but you need somewhere that allows readers to find your work and contact you. Think of like this. If you cannot put together an online presence to show off your work, then why should a reviewer? And that’s really the key point. 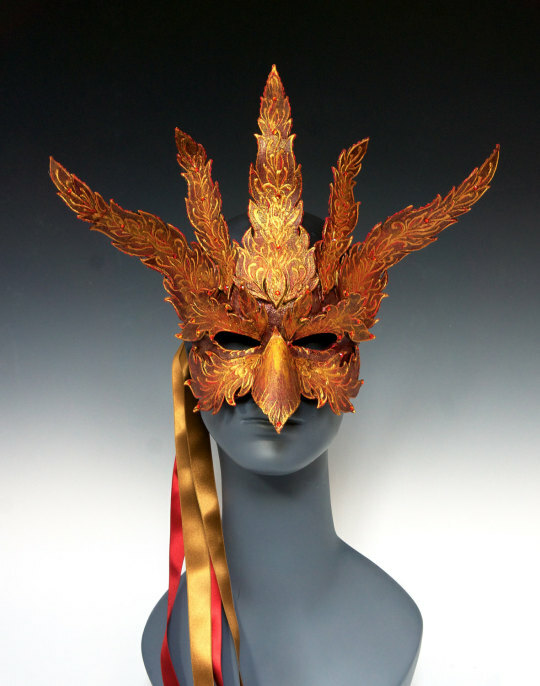 Venetian masks are some of the most beautiful masks around, so it’s no wonder that emulating that style has become extremely common with mask designs (something I appreciate as I’m not sure I’ll ever get to see the real city…). 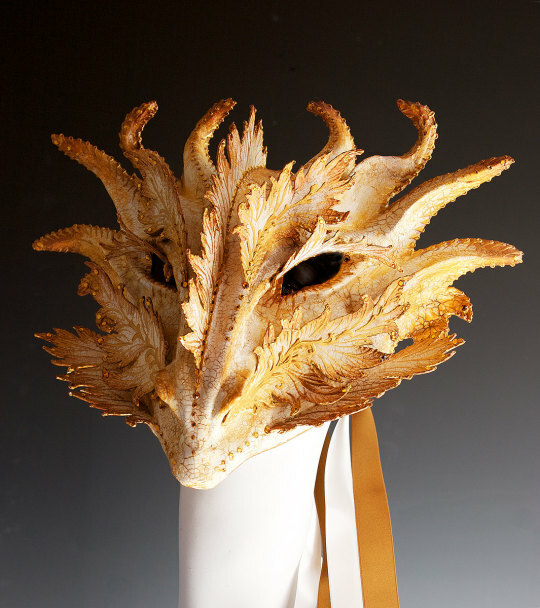 Cyndy Salisbury of The Art of the Mask on etsy really captures that style better than most however, as he designs are just breathtakingly detailed. All over the northern hemisphere Autumn is slowing creeping in. The days are shorter, the nights chillier, and if you are far enough north the leaves may already be falling. While we in the states in enjoy jumping in large piles of leaves to celebrate the season, I think I may like Japan’s tradition a bit more. It’s not leaves they are harvesting though, it’s rice straw. 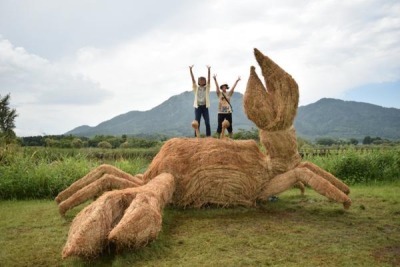 When rice is harvested in September, the rice straw (wara in Japanese) is what’s left behind. 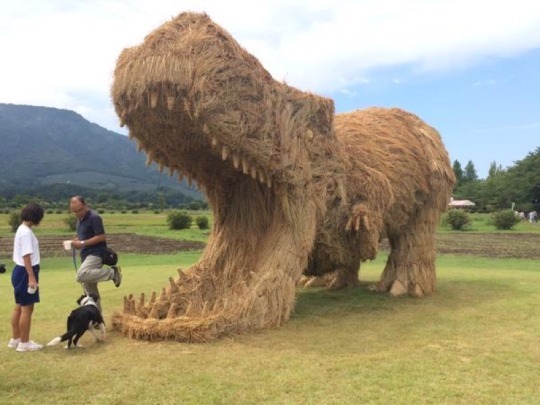 Instead of just turning into bales like we do to make hay, the locals of the Niigata Prefecture instead turn that straw into art. 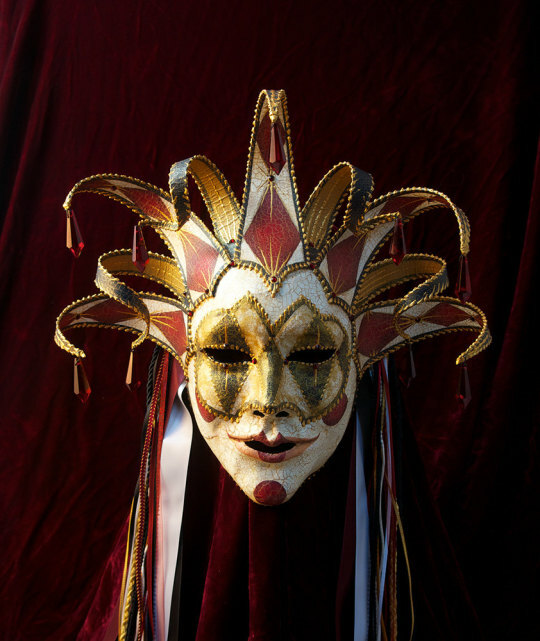 A tradition they now celebrate with their annual Wara Art Festival! This dino was my personal favorite, but the skill of these artists cannot be denied. Local artist, such as Amy Goda, use not only the rice straw but even crates to build up the size on some of these massive designs. 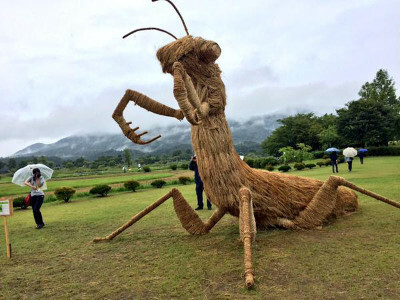 The straw sculptures will be up on display until the end of November when Winter comes calling, so if you plan on visiting Japan during the Autumn months this is definitely a cool little art exhibit I would recommend checking out. …but her designs have a large impact! On this lovely Sunday, I bring you the work of Anya Zoe. She works with yarn on a very small scale and in fact, when I first came across her booth at a convention, I almost passed it up. 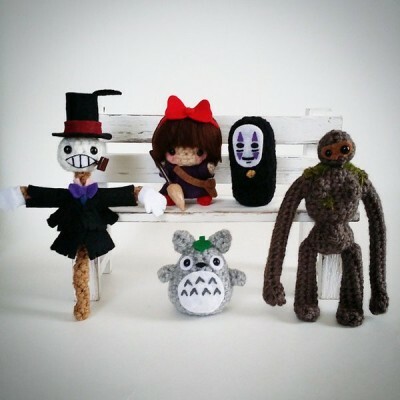 There was one thing that caught my eye in a very big way, the most amazing mini Turnip Head character amigurumi! Love Miyazaki films, too? Check these out! 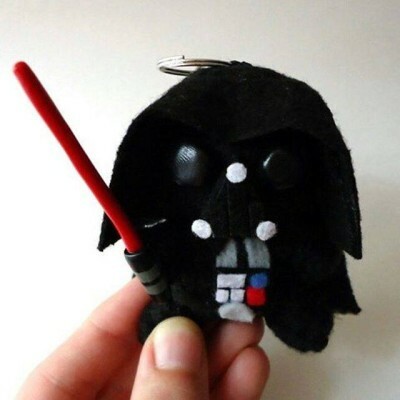 The first photo does not do justice to this very tiny scale, so allow me to illustrate the point with the following Darth Vader that will easily fit in the palm of your hand. Tiny though he is, the force is strong with this mini. 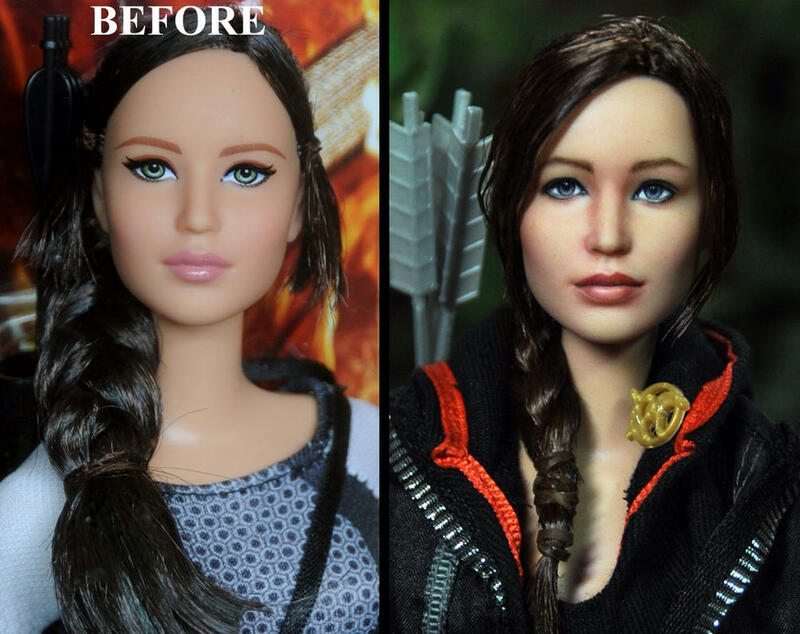 The detail that she achieves on such a small scale is just mind blowing to me. 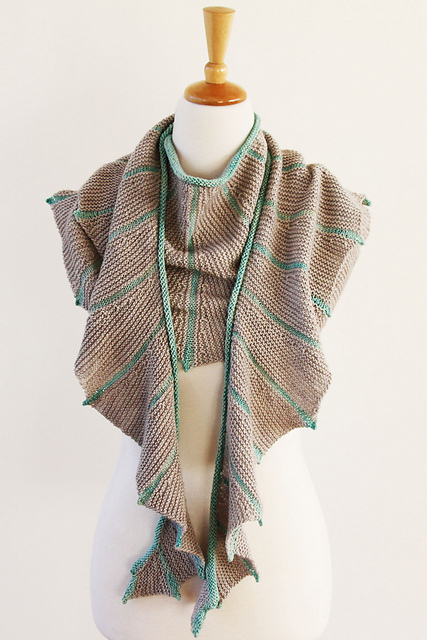 All of the itty bitty stitches complete with accessories truly elevates these to another level. Her selection is quite extensive and she is always adding to it. 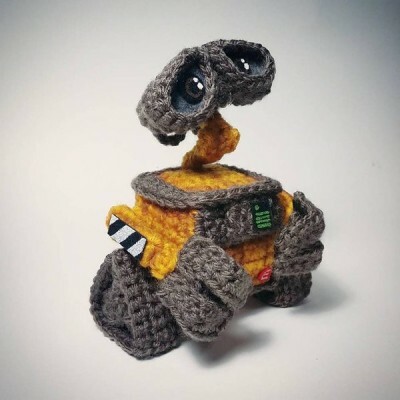 If you are also handy with a crochet hook, Anya Zoe has opportunities for you to create some of these yourself through Patreon. Patreon is essentially an ongoing crowdfunding site wherein supporters give money to an artist (or other organization) at different levels for perks. 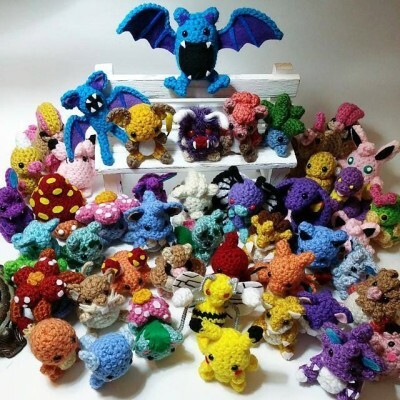 In this case, the possibilities include her amigurumi, patterns, and tutorials. 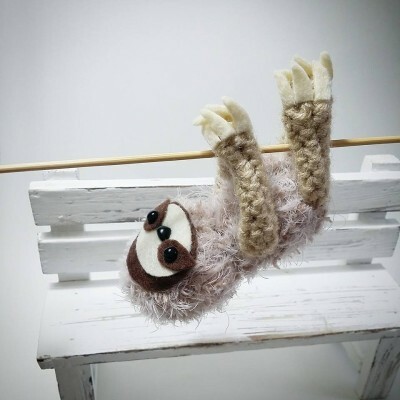 Want more adorable mini crochet creations? Anya Zoe can be found on Etsy, Deviant Art, Facebook, and, of course, Patreon. Like I said last week when I posted (here) how to make witch’s apothecary bottles, I plan on posting a few festively frightening Halloween posts with lots of decorating ideas – this is the second. 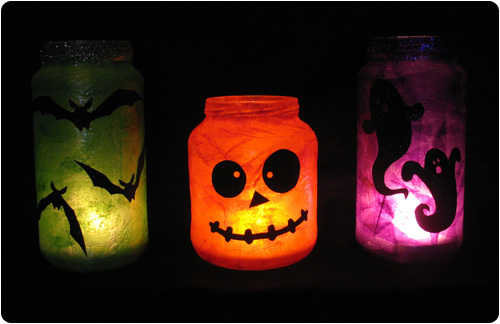 I also, in the past, wrote a post on making mason jar lanterns with yarn and paint, and I’m going to present to you an interesting and different twist on that idea. So, may I present, mason jar lanterns. Part two, I guess. I love finding decor ideas that work really well for small space living, as not all of us have full homes to decorate. Let me tell you, some of us apartment dwellers have festive inclinations that go beyond the available space. This is a very very easy tutorial that can be done in a few different ways for a few different effects. You just need a few materials and some artistic inclination and you’re set to go! All you need are some mason (or any glass) jars, of whatever size you want. You will need mod podge (which you can get in a local craft store) a painting sponge or brush for the mod podge, some tissue paper (whatever colours you’d like as the base colour on the jar) and some black construction paper. If you have a love of glitter, you can use that too, but that is only if you’re at peace with having glitter follow you around for weeks. 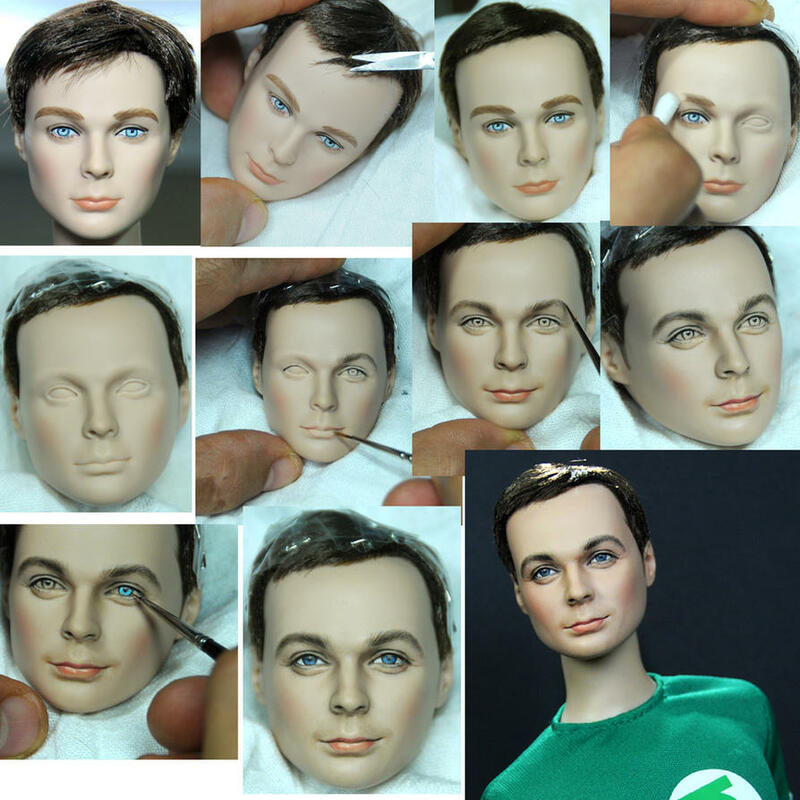 You can find the full tutorial with photos here. There’s other materials for the second technique that I’ll detail later. I love how easy this is. Once you have all your materials all you need to do is rip the tissue paper into small bits (you can cut it too for a different look. After you have lots ready, you can paint the jars on the outside with the modge podge and glue a layer of tissue paper. Make sure to paint a second layer over the tissue to seal it down. Do this as many times as you’d like to make the colour as dark as you want. Just be aware that only one or two layers will let the light shine through better. Next, while everything is drying, you will need to cut out your accents in black construction paper. 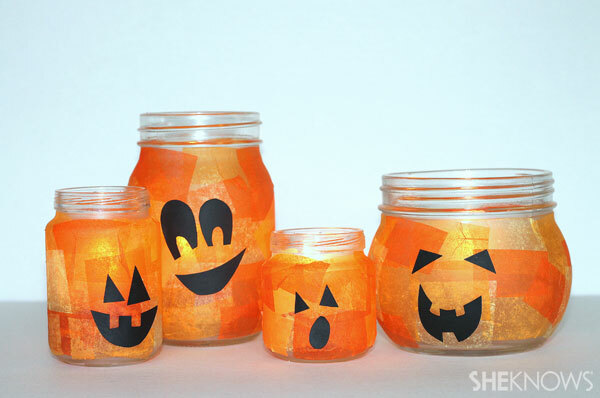 You can cut out pumpkin faces, ghosts, spiders… really whatever you would like! The last step is to glue these in the places that you’d like them to be and coat it with a final layer of modge podge. You may use glitter on your black construction paper before you apply or around the lids. But BEWARE … you use this at your own risk. Glitter will be in every crease in every place for weeks. The second method is just as easy, though a little messier if you don’t have a garage or back yard. 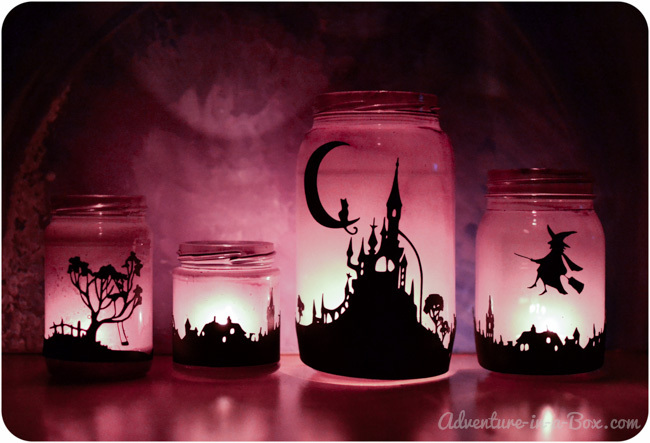 You only need your jars, spray paint and a paint marker. You’ll also need a printer and some google fu to find some images to trace if you are like me and can only draw stick figures. Again, you can find the full tutorial here, but it’s very simple. 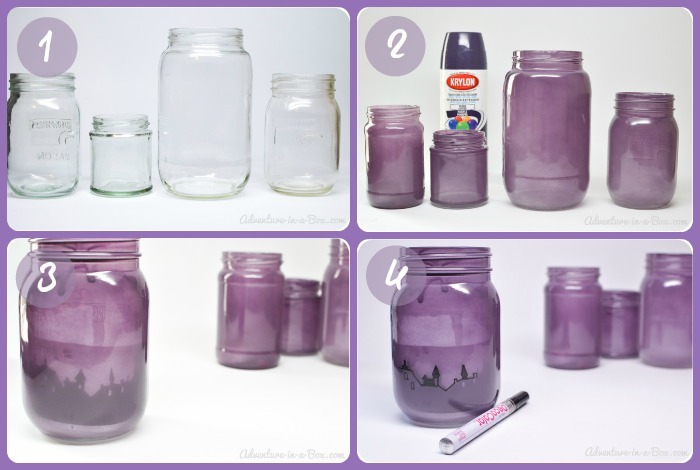 First you need to clean your jars of glue and labels, and once that is done, you can spray paint the outside of the jars. Put down newspaper for the sanity of everyone. Do one fine coat of spray paint and let it dry so you can see how it looks. It’s important to keep the paint coats thin enough that you can see the light through it. You might want to test it – but feel free to continue to spray until you’re happy with the colour. Your last step, once your paint is dry, is to use the paint marker to draw your scenes on the outside. You can use your skills to draw whatever you’d like – a graveyard, a spider web, a witch. Remember that they need to be silhouettes, so they can be details but you need to make good use of the negative space. Of course you can use the internet to find a suitable scene. Just try search terms like “Halloween silhouettes”, or something like that to find the type of image you need. To make it easy, you can tape the image to where you would like it on the inside of the jar so that you can basically trace the images (see the above image for a picture representation of the steps). Once you’ve done either of these, you can use a tealight inside, or a battery operated tealight if you’re concerned about open flames. Another interesting option, is to use small strings of battery operated Christmas lights (many stores will have mini strings to use on teeny tiny Christmas trees), and this will give an effect of fireflies in the jar. Your light source doesn’t matter too much, but it will just give you a different kind of effect and a different kind of light. Be creative, have fun and have a fantastic Saturday! 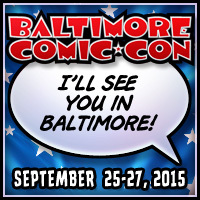 Today is the start of the Baltimore Comic Con. This is where it all started for me and I am excited to be returning to the place that told me that yes, I can make a living from quilting. Six years ago I took a chance and brought three quilts to Baltimore to display and see if there was an interest. All three of them sold and I couldn’t wait to dive in head first and make some more. Craft Hackers is located along the wall of the Vendor area that leads to Artist Alley at Tables A1-A2.. I am here with Quiltoni and Nicole is here with Craftigurumi. 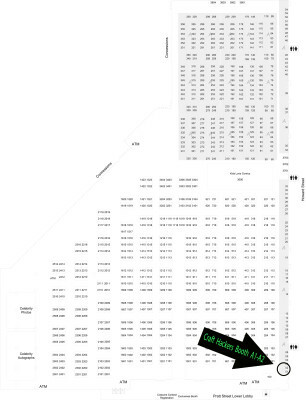 There won’t be any panels for us, so you can find us at the tables the entire convention! We will also be streaming anything interesting that we see through Hang With. If you want to be notified when we live stream make sure you follow us on Hang With. If you come to the convention make sure you swing by and say hi! Today is the start of the Salt Lake Comic Con in Salt Lake City, Utah. 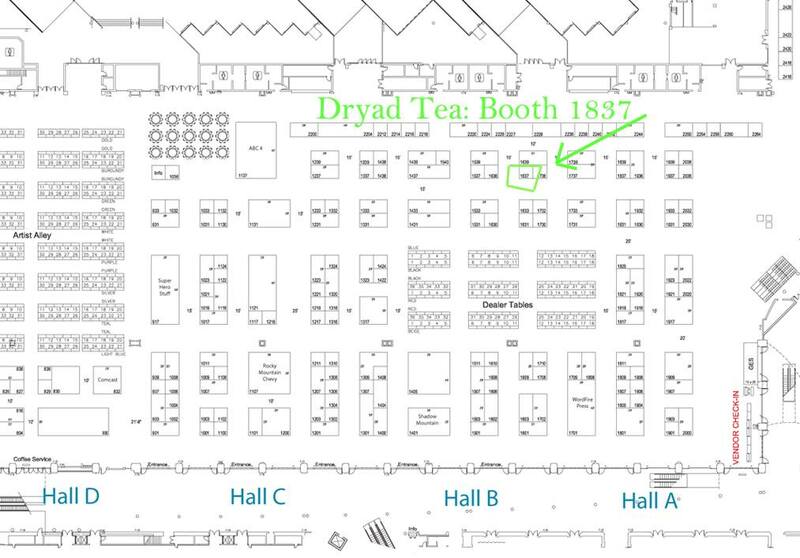 Dryad Tea will be a part of the convention and can be found at booth 1837. Featuring tea, trivets, infusers, and mugs they will have everything a tea drinker would want! 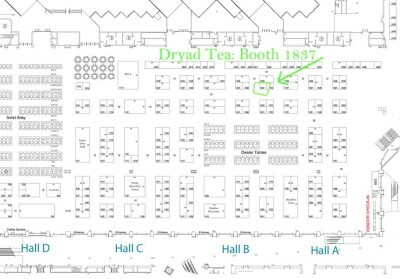 So make sure if you are in the Salt Lake City area that you swing by booth 1837 and smell some of the amazing tea blends they carry. “It isn’t a pretty place to be, but it is certainly where I have found myself lately. What is this place, you say? That’s it. I couldn’t get any further. Couldn’t even think of an analogy for “many,” “lots,” etc. I’ve been in such a creative slump that I’ve been finding blog posts difficult to compose. Part of my slump has come from how busy I’ve been, with travel, planning, and “real life” work. Its been a good month since I was last crafting and I can feel it. I haven’t actually picked up even a cross stitch, my go to background project, in several months. I’ve been tired, and busy, and not even in the country, and it has made it impossible for me to really work. This frustration led to even worse creative slump, eventually effecting even my writing which leads us to this post. Its hard to get out of a creative slump when you’re in it. As my brief attempt at research last week found, there are any number of suggestions available to try to get you out of a slump. I found my solution by accident, and I thought I’d share. 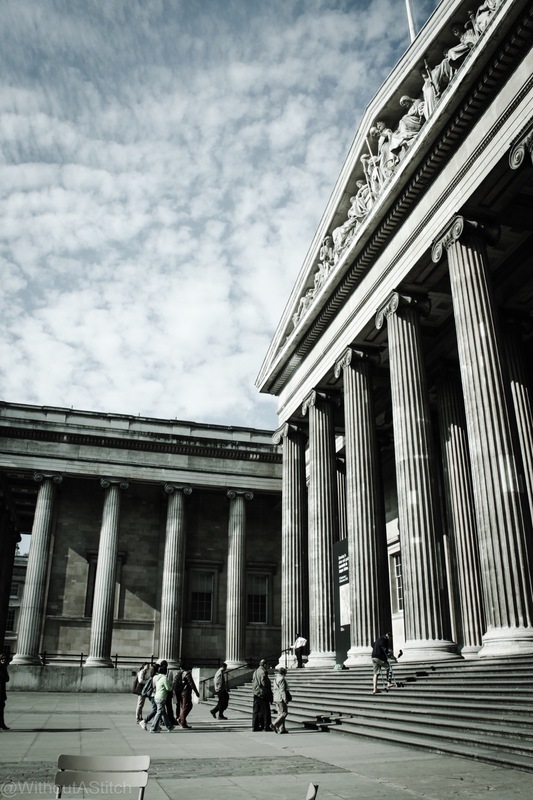 I’ve always wanted to go to the British Museum. 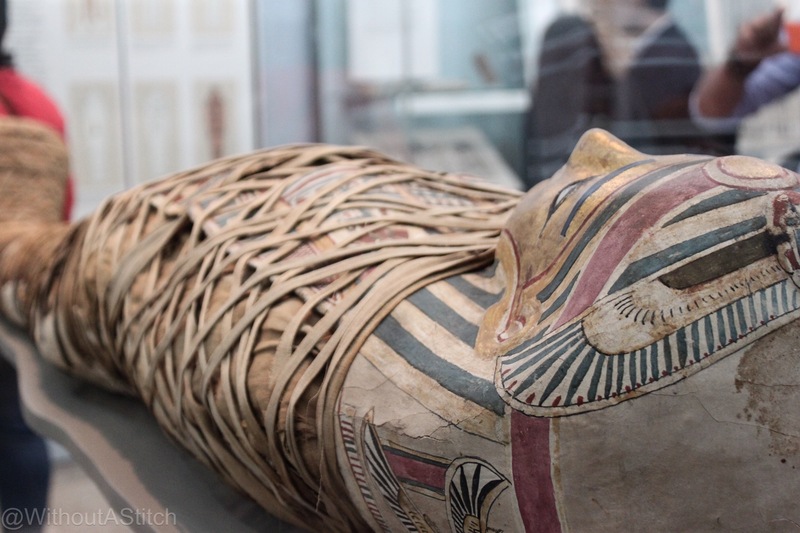 I love museums in general, but the British Museum has been on my wish list for years. 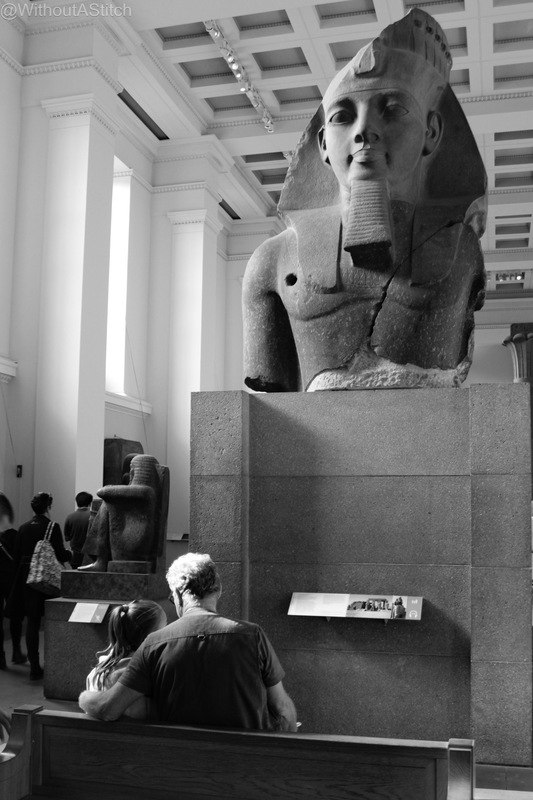 There are many museums in the world, but the British has always had a mystique for me. As I walked through the halls, everywhere I turned I found something amazing. I usually go straight for the textiles, but the British has very few. This wasn’t a problem as it turned out. I went because I wanted to see the museum and everything in it., but what I found was my creative mojo. Peering at the marvels of history, amazed at the craftsmanship of hundreds of years before, I couldn’t help but be amazed and inspired. When you think about the tools available to sculptors, woodworkers and craftsmen back in the day, the detail work is incredible. What they did, that lasted this long, to be enjoyed by people today… It is staggering to stand in the presence of such work. So next time you find yourself in a creative slump, I highly recommend surrounding yourself with an overload of beauty and inspiration. It doesn’t have to be your own choice of craft, but I do suggest something that you see in person. The power of beauty is always greater when you stand in its presence. Its a fix that I didn’t find when looking online, but it worked for me. I can’t wait to get home and get back to work on the various WIPs lying around my house. And if you, too, have been finding your creative juices on a low ebb, I hope you find a solution that works for you.